Based On: The tragic real-life love story of the Crown Prince of Austria-Hungary and Marie Vetsera. Based On: The Papalagi (Der Papalagi) a book by Erich Scheurmann published in Germany in 1920. Austria, 1888. Crown Prince Rudolph is bored with the ostentatious royal life in the Austrian court. He is forced into a marriage contract with Stephanie, Princess of Belgium. The couple is incompatible and they live in unhappy discord. Grand Duke Jean Salvadore, Rudolph`s cousin, is in touch with the liberals of the realm and his lover, Milly, is a commoner. The Grand Duke has broken the shackles of convention and he enjoys a life of freedom much to his cousin`s envy. During a performance of "Hamlet", Rudolph meets Maria Vetsera, the daughter of Baron Vetsera, the wealthiest man in Vienna. The Prince and Maria fall in love at first sight and continue meeting secret. Duke Friedrich, the Minister of War, learns of the love affair. He plots to use the affair to his advantage and put his own nephew Ferdinand in Rudolph`s place as Crown Prince. The Duke reports to the Emperor that Rudolph is meeting liberals and that he is also having secret rendezvous with Maria. When the Emperor learns that Rudolph has petitioned the Pope for a divorce from Princess Stephanie he flies into a rage and orders Rudolph and Maria to part. Rudolph feels he must make a choice, the throne or Maria. In January of 1889, Rudolph announces that he is going on a hunting trip. He departs for Mayerling with his beloved Maria. Duke Friedrich discovers Rudolph`s plans. The Duke sends out a party who masquerade as revolutionaries so that Rudolph can be arrested as their leader. Blissfully unaware of the tragedy about to unfold, Rudolph and Maria alone in the surroundings of peace ans beauty spend their last night together. 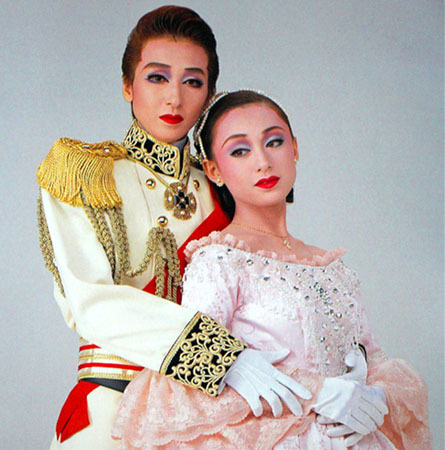 Shion Yuu was ill for the Takarazuka run, therefore Asaji Saki covered for her. The DVD recording features Asaji Saki in the lead role; however, there were two versions of the live CD released: one featuring Shion Yuu, the other Asaji Saki. Created by Valjean87. Last Modification: Monday 25 of February, 2019 08:06:24 PST by caithion.